Hold that carriage... I mean, cab! It’s been a year and a half since the fiendish crafters of this outstandingly clever contemporary-times adaptation of the adventures of Sir Arthur Conan Doyle’s deathless super-sleuth left loyal viewers hanging from a narrative cliff that looked rather like the edge of a swimming pool. The modern borderline-sociopathic genius version of Sherlock Holmes – played with such tremendous grace and mercilessly pinpointed energy by Benedict Cumberbatch – was facing off in that aquatic centre with his mugging, twitching nemesis, James Moriarty (Andrew Scott), with a gun, a bomb, and a Watson (Martin Freeman) between them. It was a nailbiter of a climax to the superb first season of Sherlock, the two masterminds reaching a cognitive stalemate that can only be broken by a leap of brinkmanship, an irresistible force of death-embracing will. At the time of “The Great Game”, the episode which ended in that indoor pool, I immediately associated this face-off of arch-nemeses next to a body of water with the most famous such confrontation in the Holmes canon, the precipitous plunge at Reichenbach Falls in “The Final Problem”. Although co-creators Steven Moffat and Mark Gatiss (the latter also plays Mycroft Holmes, Sherlock’s smug government agent brother) were certainly nodding slyly in the direction of this well-known crossroads for the famous consulting detective with this moment, the second season demonstrates that they have a longer game in mind for this particular take on one of English literature’s most indelible rivalries. 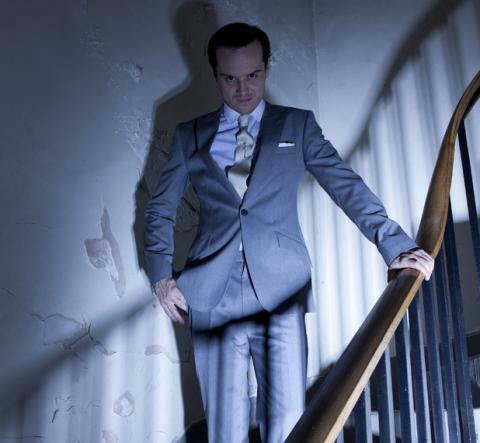 “A Scandal in Belgravia” enters right where “The Great Game” exited, defusing the prodigious tension as if it’s all a lark: Moriarty’s cell phone rings (his choice of ringtone makes for a big laugh as well as a stealthy metaphor, and it makes another appearance at season’s end) and he postpones the deadly cat-and-mouse faceoff until another day. In the meantime, Sherlock has other challenges to contend with, namely his feminine sub-nemesis Irene Adler (Lara Pulver) in “Scandal” and a supernatural canine threat to his commitment to reason in “The Hounds of Baskerville”. But Moriarty seems to lurk behind it all, and their renewed conflict in “The Reichenbach Fall” brings the season to a crashing, stunning close. Although Moffat and Gatiss have avowed their intention to upend the canonical assumptions of Holmesian purists with their spin on the classic material, Sherlock has largely been embraced by those same purists nonetheless. Despite its modern setting, razor wit, consistent exploitation of technology, and canny self-knowing qualities (who knew that excessive homosexual implications could be tossed at the central duo and yet still be funny? ), it displays a much greater affinity to the core appeal of Conan Doyle’s novels and stories than Guy Ritchie’s recent action-packed film versions do, even if the latter preserve the Victorian period surroundings generally thought to be so vital to the wider picture. Perhaps, with nearly every American television serial from House on down cribbing notes from the Holmes playbook, we should not require Sherlock to demonstrate how vestigial the foggy London streets and rattling carriage wheels are to true Holmesian narratives, but it has certainly conclusively proven that the great detective can become unstuck in time and yet remain perennially himself. Much credit for this is due to the writing of the show, which combines homages and smart nods to canonical elements while gleefully thumbing its nose at other ones. Thus, we have Holmes and Moriarty in “Reichenbach” pushing each other over the edge towards the endless drop of mortality not in the midst of a physical clench but in an intellectual one, feeling each other out with the highest of stakes to see just how far the other will go before the end. In “Hounds”, certain elements of the canon’s menacing pinnacle are preserved (the oppressive atmosphere of existential doubt as well as the brooding moors and the otherworldly beast that embody it) while more specific elements are happily, pointedly jettisoned (Sherlock teases with the possibility that he won’t initially come out to Dartmoor, as in the novel, before dismissing such a thought as ridiculous; he wouldn’t miss such an enigmatic mystery for the world). And “Belgravia” is mostly as close to a straight adaptation of a Holmes tale that the series has attempted, even if a firm commitment to the extent of Holmes’ admiration for/fascination with Irene Adler is ultimately made, unlike the closing ambiguity of “A Scandal in Bohemia”. But we must also credit the acting for the success of the venture in the face of the looming weight of the canon. To watch Cumberbatch at work here is like gazing at a comet blazing across the black canopy of night. He’s always already Holmes, and he definitely pops his coat collar when he wants to look cool, as Watson accuses him of doing. But then, what is the Holmes role than one extended popped collar anyway? The theatricality of Sherlock is the note that Cumberbatch hits more purely than nearly any other portrayer of the detective (the purist fave Jeremy Brett was a touch too bitter, Robert Downey, Jr.’s recent blockbuster version too grubby and Bohemian by half, if not by three-quarters), although he is also wonderfully cold and calculating with nary a hint of human vulnerability. These elements grant an extra charge to his interactions with Scott’s swinging psycho Moriarty. The sequence in “Reichenbach” in which the latter’s master plan to demolish Holmes’ reputation is revealed is a fine example: while Watson argues and defends and resists, Cumberbatch’s Sherlock stares at Moriarty with mingled loathing, approbation, and bemused enthrallment. It’s a heck of an expression that he’s wearing, and a heck of a choice by a heck of a thespian. 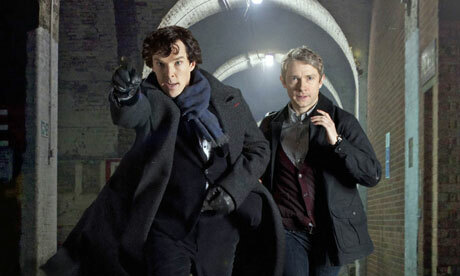 Of course, adding Martin Freeman’s prickly, steadfast Watson as an anchor only makes it all work even better. The performance history of the everlasting sidekick Dr. Watson is not nearly as crowded with greatness as that of Holmes, largely defined in the popular imagination by Nigel Bruce’s clumsy oaf in the pre-WWII film versions with Basil Rathbone as Holmes. Jude Law’s formidable take from the aforementioned recent steampunk-inflected Holmes films stands out in this context, but Freeman’s interpretation goes further in order to get closer to the essence of Watson. He stands up for Holmes, of course, wasting the demon hound in “Hounds” and socking a supercilious suit from the Met Police when his friend is arrested in “Reichenbach”, but he also chafes at the sleuth’s thoughtless misanthropy towards humanity at large as well as towards his flatmate and only friend. Freeman makes fine use of his well-honed sarcasm and his stony exasperated glares as a Watson helplessly trying to make the incomprehensible processes of genius deduction intelligible to himself at least (and perhaps to others, through his blog on Sherlock’s adventures, the show’s version of Conan Doyle’s self-reflexive running joke on the publishing history of his stories). As wonderfully entertaining as this season of Sherlock was (though perhaps not quite up to the standard of the first season, and the first and last episodes in particular), one does wonder about the wisdom of burning through the three most famous tales in a single stroke. There will be a triumphant return to start with next time around, and still reams of canonical material to draw from and adapt wittily to modern tastes and circumstances; British television of this high level of quality rarely runs very long anyway, so one might as well shoot the bullets before they rust. But one worries that, like Conan Doyle’s entries after his attempted disposal of his burdensome yet iconic creation, what remains is less absorbing than what has already come and gone. Mild qualms aside, the greatest downside of this excellent second season of Sherlock is that a considerable gap of time stands between us and a third season, with only highly rewarding repeat viewings to sustain us. There are worse ordeals, I suppose, but I don’t like to imagine them.